If you need an oil change, Sacramento has seemingly endless options to choose from. You could go with a quick lube shop or you could go with whoever sends you a coupon in the mail, but are you really getting a good deal with these options? At OK Tire and Automotive, we provide top quality auto repair, auto maintenance, tire repair, and oil changes in Sacramento that are truly a great deal because we care about each and every customer that comes through our doors. Complimentary 32-point Vehicle Inspection & Tire Rotation with Every Oil Change - Sacramento Drivers Take Note! At OK Tire and Automotive, when we say we provide top quality quick lube services, that's because we go above and beyond the regular oil change. Sacramento drivers, when you bring your vehicle to us, in addition to your lube, oil and filter service, we also perform a FREE 32-point vehicle safety inspection and a FREE tire rotation! That's because we are a family-run auto repair shop, completely dedicated to providing the absolute best value to our clients, while ensuring that they stay safe on the road. Whether you drive a car, truck, SUV, minivan or hybrid vehicle, our talented team can help you better care for your automobile. When you bring your vehicle to us for car maintenance services or car repair, you can trust that your vehicle is in good hands. All of our mechanics are highly skilled, ASE Certified Technicians who have the necessary tools and experience to provide our auto services quickly and efficiently. We know that it isn't convenient to be without your car for any amount of time, so if you really don't want to miss a second of the day, make sure to take advantage of our free vehicle pickup and delivery service! Ask any of our friendly service advisors about how to set this up, and we will be happy to help your day stay on track. 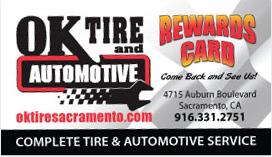 Loyalty Rewards Program - FREE Oil Change in Sacramento! Now OK Tire and Automotive has made it even easier to keep up with your vehicle's regular maintenance needs. 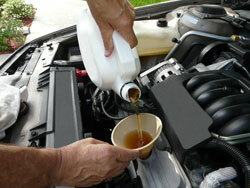 Enroll in our Customer Loyalty Program, and when you buy 4 oil change services, you get the 5th oil change FREE! That's like getting 20% OFF of your next 5 express lube services! Taking care of your car's regular maintenance services is something that your vehicle needs in order to run its best, so this Customer Loyalty Program is our way of rewarding you for your greatly appreciated loyalty to our local, family-run auto repair shop. To signup for our Customer Loyalty Program simply stop by and talk to one of our friendly service advisors, contact us online, or give us a call today.